This year, as we celebrate the 50th anniversary of the US Open, we’re counting down the 50 most memorable moments in the history of America’s Grand Slam. Today, we take a look back at No. 38. Members of the tennis cognoscenti who believe that Martina Navratilova may well be the greatest women's tennis player of all time point primarily to her versatility as both a magnificent singles player and a top-of-the-line doubles player. Her extraordinary range of talent in both forums was brilliantly showcased many times across her sterling US Open career but never more prominently than in 1987. At the age of 30, Navratilova celebrated her finest year ever at the US Open. She toppled her foremost rival Steffi Graf in the singles final, winning their title-round contest, 7-6, 6-1, with a cerebral performance. It was Martina’s fourth and last triumph in singles. She completed the win over Graf shortly before a heavy rainstorm. Returning the next day in bright sunshine, Navratilova joined Pam Shriver for the women’s doubles final against the formidable team of Liz Smylie and Kathy Jordan. Navratilova and Shriver dropped a tight first set and fell behind 1-4 in the second, but they fought back commendably to win, 5-7, 6-4, 6-2. Two titles down, one to go. Now, Navratilova and Emilio Sanchez of Spain engaged in a marathon mixed doubles final against the American tandem of Betsy Nagelsen and Paul Annacone. This one went down to the wire, but Navratilova and Sanchez were victorious, 6-4, 6-7, 7-6, in a riveting clash. And so Navratilova had pulled off a “triple” at the last major of 1987, sweeping the singles, doubles and mixed doubles titles and affirming to her legion of admirers that there was no more complete player in tennis. She realized this remarkable feat in the 100th anniversary year of the first U.S. National Women’s Championships. 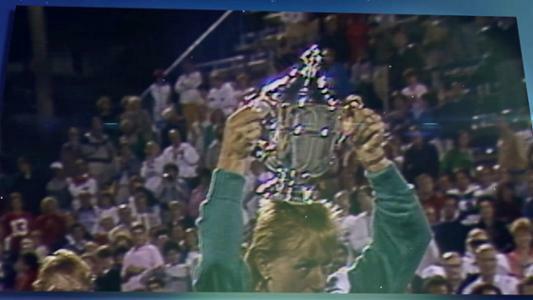 No one has won the triple in New York since Navratilova did it 31 years ago. And it is highly unlikely that anyone will achieve that rare feat again in the future. Her versatility and completeness as a champion was in full view in 1987 at all three events. This was Martina Navratilova at her very best. Join the celebration. Share your favorite on/off-court moments from the US Open using hashtag #USOpen50, and be sure to tag @usopen to be featured here.